Happy Kitchen Sink Stamps Monday, thanks for stopping by! With the weather turning cooler, and Fall arriving last week, I reached for the beautiful Multi Step Trees for my card today. This also fits this months Crew Challenge - Ushering in Fall. This is just beautiful! The paper just screams Fall! The colours you've used are gorgeous. Fabulous card. 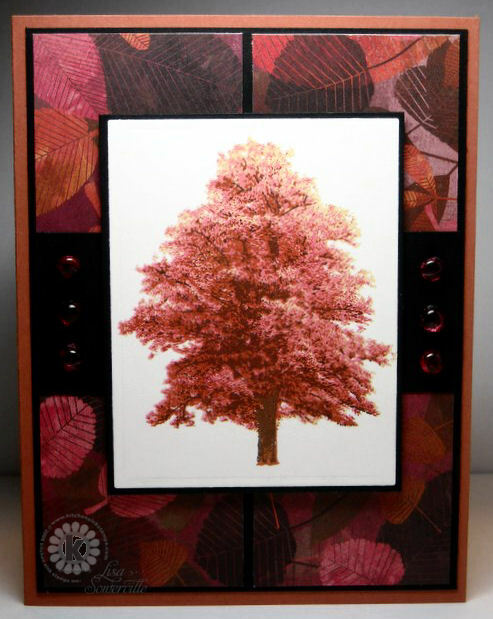 Just beautiful, luv the dark paper behind the beautiful blazing tree. What a gorgeous autumn tree!! I love this beautiful card, Lisa!! You matched the colors to perfection!!! What a gorgeous card, Lisa! Every time I see the tree image, I get goosebumps! This one is no exceptional...absolutely stunning! Just once I'd love to go paper shopping with you. You always have the most gorgeous cards. I love the rich warm colors for today's creation. Wow! I wasn't sure if my comment went through. Please only show one. This is a beautiful card. I love the colors that you put together! This looks as if it could be an actual photo of a tree in autumn! Wow, this tree color is so stunning! Beautiful card!! Oh and when you go paper shopping with Inky, let me know! Oh Lisa!! This is just amazing! The color in the DP and the Tree are just perfect!! I love this stamp set and your coloration is spectacular.